We left Kolkata in an air-conditioned train car. Not because Yann had given in to getting one, but because we couldn't get anything else. We had a date with James and Antonia in less than 48 hours who were arriving from Southern India and we didn't want to be late. I was (as any normal human being would be) relieved to know that I would get sleep on the 22 hour train ride, since I certainly hadn't had any in Kolkata. We had spent two nights in a non-ac room with intermittent electricity (read intermittent fan), next to the festering public washroom and a drunken guest who stayed up all night with the door open and no shirt on. When we arrived in the room we had an argument over who would get the bed next to the filthy wall and who would have the bed covered in crusted instant noodles (I ended up with the noodles because at least I could identify that they were noodles, unlike the stains on the walls). 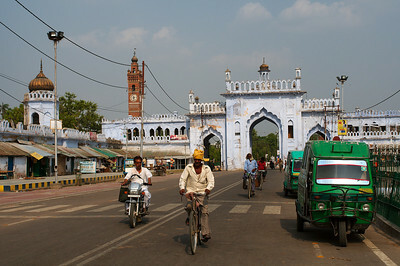 We arrived in Lucknow in the evening, one day before James and Antonia's plane was landing at the Lucknow airport. This gave us time to 1) Find a hotel room and 2) Eat meat before we turned exclusively to vegetarian fare (actually, we are big meat eaters in India, but Lucknow's famous Mughal-inspired cuisine is heavy in the meat department). Finding a meat-filled meal was an easy task, as henna-dyed bearded men watching over their huge cooking pots called for us to visit their respective restaurants. Finding a hotel room was unusually difficult. For a long while it seemed like our only option was a rooftop room/sauna, the only room left in a hotel known to take foreigners. We visited dozens of hotel front desks before we finally found one that would take us. It was pricier than we wanted to pay, because all of its rooms were air-conditioned (but that made it easy for me to be convinced). 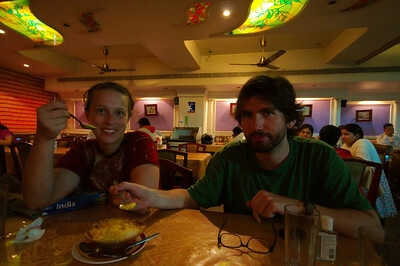 We were worried that James and Antonia would think it was too expensive at 800 rupees (about 20$CDN). But by guaranteeing their presence the next day we were able to bargain the rate down. It was a huge relief when James and Antonia exited the airport (the last two). We had decided that they had missed the plane, but had received a positive ID of two "white people" on the plane from another passenger. We had been locked out of the airport waiting room due to the arrival of a politician on their same plane, and we had been lying on the hot pavement outside for almost an hour when James and Antonia finally exited. The airport billboard displayed a temperature of 47.6 degrees Celsius. Antonia described getting off the plane and thinking that she being blasted by the plane engines before realizing that the heat was simply the ambient air. Welcome to the Northern Plains ... in June. The four of us decided to stay an extra day in Lucknow before heading to Kanpur for the pre-wedding preparations. Yann and I had already spent the day visiting Bara Imambara, Lucknow's epic Mughal shrine and we felt that James and Antonia couldn't leave without seeing it. We lined up back-to-back activities for the next day but spent the evening relaxing in our air-conditioned rooms sharing stories of our past weeks' adventures (James and Antonia in Southern India and Yann and I in Bangladesh). Our first morning started with breaking in James with a road side breakfast. Yann and I had decided long before leaving for India that we would deal with James' relative travel inexperience with baptism by fire. Baptism by fire (from Wikipedia entry) :" Today, it has entered the common vernacular to describe anyone doing something "the hard way" for the first time, particularly if training is necessarily insufficient to fully prepare one for the experience (as is the case with battle)." We picked a busy street stall and ordered four breakfasts. The food was good and hot and Yann and I settled into our smug "see that wasn't so bad" attitudes until Yann spotted the dishes being washed out of the corner of his eye. He mumbled under his breath for me to look over. The dishes we were just using were being washed in a stream next to a huge pile of medical waste, including dirty needles. It didn't take long for James to recognize in our faces that something was wrong. I had brief moment of fear when James noticed the dishwasher, not because our dishes were washed in medical waste, but because I thought James might strangle me. But the situation was just so absurd that we had to laugh. Thus started out first morning together and our failed attempt at making James see the harmlessness of eating street food. We spent the morning visiting the former Residency of the British Resident General in Lucknow. the former British complex where thousands of soldiers and civilians spent almost 3 months under siege by "mutineers" during the first Indian uprising against British rule (1857). It is an interesting sight as one tends to sympathize with both sides of the battle, the hundreds trapped inside the crammed complex dying of disease and cannon fire and the Indians taking up arms against oppressive foreign rule. The sight itself is known as "The Residency" and has a museum on sight as well as the preserved ruins of the former residency buildings. The grounds are beautifully tended to and we might have lingered longer outside if it hadn't been almost 50 degrees. 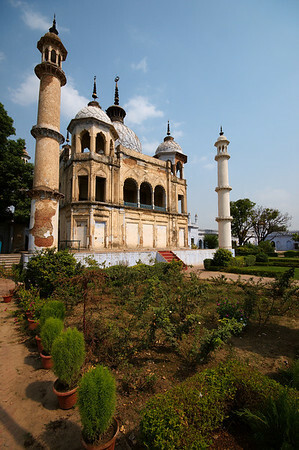 In the afternoon Yann and I waited outside the huge Mughal shrine, Bara Imambara, while James and Antonia visited. They described a similar experience the one we had experienced the previous day: being the only foreign tourists, posing for dozens of photos with Indian tourists, signing the guestbook on the request of the complex security guards while they looked over your shoulder to make sure only good things were written, taking off your shoes to enter the shrine and then burning them on the hot rooftop stones, resisting an attempt to be assigned a mandatory guide for the "Labyrinth"... All and all a fantastic experience. In the afternoon we made us of our "Lucknow Tourist Pass" and visited the smaller Chota Imambara, the Clocktower, the Jama Masjid (actually non-Muslims weren't allowed in this one, but we peered through the gates). A pair of rickshaws carrying foreigners seemed to garner a huge amoutn of attention and locals waved and yelled out hellos as we passed them. We were sort of surprised by the amount of attention we got, which was quite unusual compared to other Indian cities we had visited. Other than the heat, we had quite a perfect day, ending with a bowl of kulfi-falooda, a local specialty. Kulfi-falooda is ice cream (kulfi) covered in orange vermicelli noodles (falooda). Actually I'm not sure what the final verdict was on this dessert, but the four of us seemed to agree on our love for Lucknow. I just popped by to see if there was anything new and...woohooo...all kinds of stuff. It was like watching a whole season of my favourite show. This stuff is SOOOO good. Beautiful photos and words.